Although I use a range of printmaking techniques I find that collograph printing provides me with the fullest range of expression. Collograph printing is where you build up the printing plate by collaging materials onto a card or board base. A range of natural and man-made materials can be used to give a variety of textures and shapes. Collographs are normally printed like etching plates i.e. intaglio, so that the indentions hold the ink and that is what is printed onto the paper. 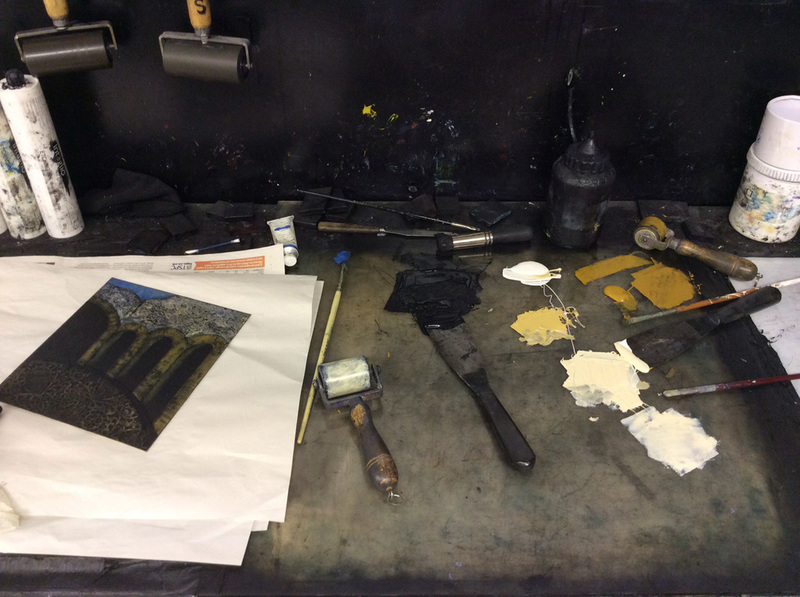 However a roller can also be used to add colour to the upper surface of the plate (as is used for relief prints such as linocuts). Chine collé (collaging thin tissue paper) and hand colouring are other ways of adding colour. The nature of this print process means that usually only a few prints can be editioned from a plate and even then there can be variation in the edition if I have 'painted' the ink on rather than using the standard overall inking method. I regularly lead workshops on collograph printmaking at the Fife Dunfermline Printmakers Workshop.